Treasure's legendary debut shoot'em-up game; in Radiant Silvergun the ship had three guns that could be used in six combinations. Points worked as experience points for your ship, increasing the level of the gun you used to earn the points, and points were mostly earned by shooting down enemies of a certain colour. 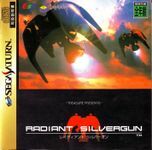 Radiant Silvergun was never released in the West, but is considered as one of the most well-made of all shoot'em-ups in the history of games, and the Saturn original can today cost vast amounts of money.